Aurore Kichenin is now Miss World France 2017. She will represent France at the prestigious Miss World 2017 beauty pageant slated to be held on 18th November. Aurore was placed as the first runner-up in Miss France 2017 competition. The announcement was made on August 5 at the Miss Languedoc-Roussillon regional pageant. 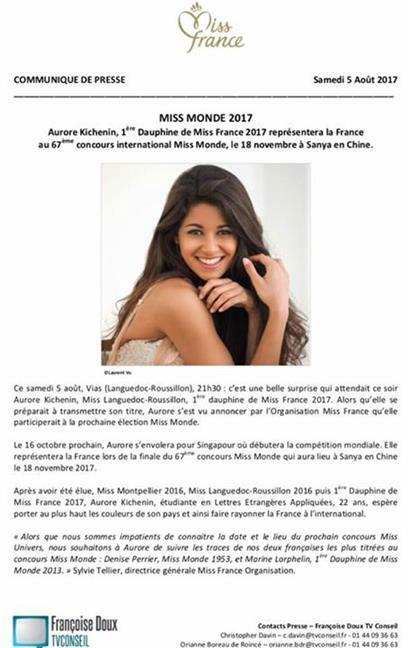 An official press release was also posted on the official Miss France Facebook page. Kichenin, who represented Languedoc-Roussillon at Miss France national beauty pageant, is a young 22-year-old student. This beautiful yet talented beauty will definitely make her country proud. Aurore has amazing skin, a flawless figure, and beautiful big eyes. She is an example of simplicity and humbleness. The stunner can give a tough competition to other contestants. It will be quite complex for the jury to select the best this year. France won the Miss World title once, (1953) with Denise Perrier. The country almost won the crown again when Marine Lorphelin finished as the 1st princess in 2013. Do you think Aurore Kichenin will be able to clinch the coveted title this year?